Writing can be a thorn in a reluctant’s writers side. I have had a few of my boys that just couldn’t stand to write because they had no interest in the subject. It’s important to help students find an interest in a subject to engage in creative writing. Often it’s FUN for students to write about a person of value to them or an event that they feel has made an impact. Saint Valentine is a wonderful story of a servant of God. My children always enjoy hearing me read about his love for the people during the Winter months. 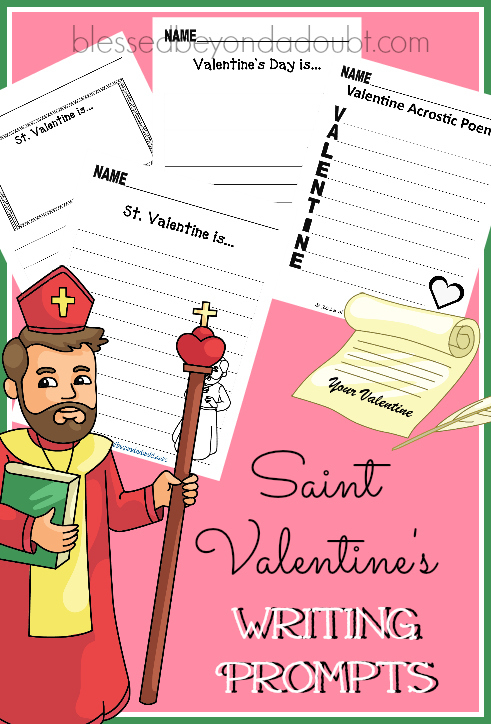 These Saint Valentine’s writing prompts will help your student to remember his kindness and will get their creative writing juices flowing. There are 6 pages in this Saint Valentine’s Writing Prompts Printable. Use them all or pick the ones that will suit your student’s needs. You can adapt to them any grade level. I created this printable pack for my email subscribers. Simply fill out the form below and the PDF will be sent to you immediately via email. Please check your spam folder. I create several freebies weekly, so you will always have something to look forward to. Thank you for pinning these Saint Valentine’s Writing Prompts for others to enjoy.